It has taken almost a decade for the software industry to absorb all the ramifications of moving from perpetual license pricing to SaaS subscription pricing. The longer payback period for investors, the headaches of high acquisition costs, and the upfront pre-revenue investments in infrastructure being just a few of the issues with which SaaS entrepreneurs and VCs have had to wrestle. So, why go out on a limb looking for new revenue and higher margins by experimenting with even more unconventional monetization models? Won't this just make a bad situation worse? To temporarily borrow a well known trademark, the reason is simple: it's the network. If there is a common theme emerging from this short list of dos and don�ts then this is it. It's the network. It's the Web. 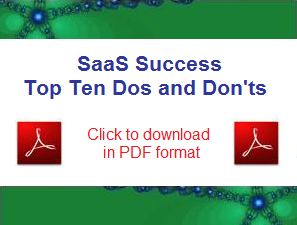 SaaS is not software. New business value arises from the characteristic that your software-as-a-service offering, unlike licensed software, can become a network hub that can connect any business entity, user or system it touches to any other: your prospects, your customers, your partners, your customers� customers, your customers� vendors, your customers� partners� customers, and so on all the way out to the edges of the Web. Given that value is created by the network, it follows that new network-based monetization opportunities are also created. Here is a quick (and very incomplete) list of new monetization opportunities open to software-as-a-service businesses. The monetization opportunities open to you will depend on many factors, including the nature of your business, the attitudes of your customers and the sophistication of your product. But most importantly, it will depend on your own creativity.